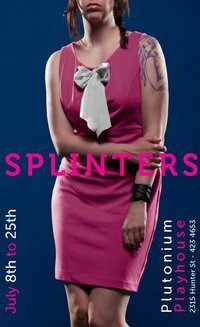 New Plutonium play tackles the complexities of sexual identity. Don’t let the plot fool you: Splinters is not based on a true story. It’s just a story that happens to be true. Maybe that’s why it’s so easy for straight folk to (mostly) fill the production. Three out of the show’s four actors are straight (including Stephanie MacDonald as Belle), as well as the director, Simon Bloom. That’s why Bloom finds it so easy to bring out other themes in the play, like what he calls the show’s “undercurrent of scopophilia.” Imagine, onstage, walls of a house made of long, broken-up pieces of thin wood, and characters shadowed in the background, watching the action before them. Just not her life. Sort of.